Grubzon - A Gourmet Voyage: 1441 Pizzeria - Fort, Mumbai. Storms, monsters, pirates - we faced them all but none perhaps was more terrifying then what lied ahead. The fabled sea of shipwrecks. It boasted of beautiful islands and legendary restaurants but all of that came at a price. Of every ten ships that would enter this sea, only one would successfully sail out. Me and the crew had a discussion late in the night. Yes, we all desired the blue compass but was it worth the risk? Just then the lookout rang the bell. We were passing a rather small isle with nothing but a single tavern on it. The island was the last piece of land before the dark dangerous sea. It was always better to discuss matters of such importance over food. Maybe we could get some useful information as well. 1441 Pizzeria at Fort is a new outlet of an already established brand. The restaurant feels like a small bistro and may sometimes resemble a quick serving restaurant. 1441 is named after the co-ordinates of the town of Naples that is 14 East and 41 North. 1441 boasts of being the only wood fired pizza place in Mumbai which lets people design their own pies. Its a true pizza parlor in that sense. I was invited to a pre-launch meet by the restaurant's PR. The meet was attended by fellas who wrote on Zomato. Though, a little oversight saw far too many people being invited and crowding the little restaurant. I was asked to shift a couple of times to make way for groups of "foodies". The joys of being a solo writer, ha. The staff for the most part was nice which was commendable given the chaos that had descended upon the room. The restaurant had a lovely neighborhood cafe like appearance. The walls showed scenes from Naples and there was even a map of Italy. Had the place been less crowded that day, it would have actually been a nice little sanctuary from the busy road outside. 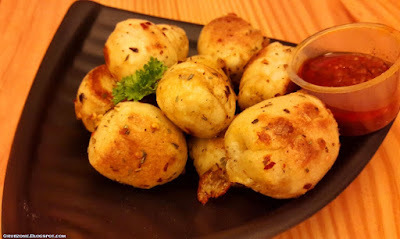 Dough Balls make a nice replacement to the overused garlic breads. Traditionally, these must have a smooth surface, golf ball like shape and soft texture within. 1441's variants were were tough, chewy and I was also unable to cut these with a knife and a fork. It is likely that I got a bad batch since a lot of folks seemed to enjoy these. BBQ Chicken Pizza. 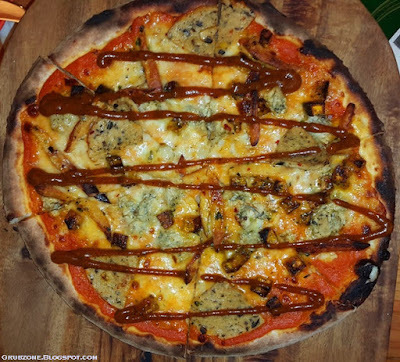 Though 1441 brands itself as a pizzeria where one can design their own pizza from scratch, I was strangely recommended to try one of their pre-made combinations. Being privy to the horrors that can be unleashed by laymen in a kitchen, I decided to take their advice and play safe. Though not wanting to go home without testing the customization bit, I decided to add a few more toppings to the fixed design. No worries, I knew these combinations worked from experience. I was a little saddened that pork options were missing from the menu. Parma ham and Chorizo make some great gourmet pizzas. The pizza was very different from my expectations. This was not due to my additions, mind you. It was due to two factors. A good napolitana pizza always has a leopard print base which was present here too but the base's appearance and flavor also signified a bit of overheating. The spots should never become too big because that can be a turn off to the rustic experience. Subtly charred should never become burnt. The Mama's sauce used in the pizza resembled Pumpkin puree and was a bit a mismatch as far as flavors go. I would have preferred San Marzano tomato paste instead. I am told that they do offer an Italian tomato sauce, so thats for next time. Thankfully, the sauce had not invaded the entire pie and was only present near the edges. The rest of the pizza was a satisfactory experience. Pesto chicken, herbed salami and spicy sausages made a delectable combination in flavors. Captain : Rather small place eh? Crewmate : There are a lot of sailors here. Are they all going to the sea of shipwrecks? First mate : Unlikely. Think these be traders passing by these routes. 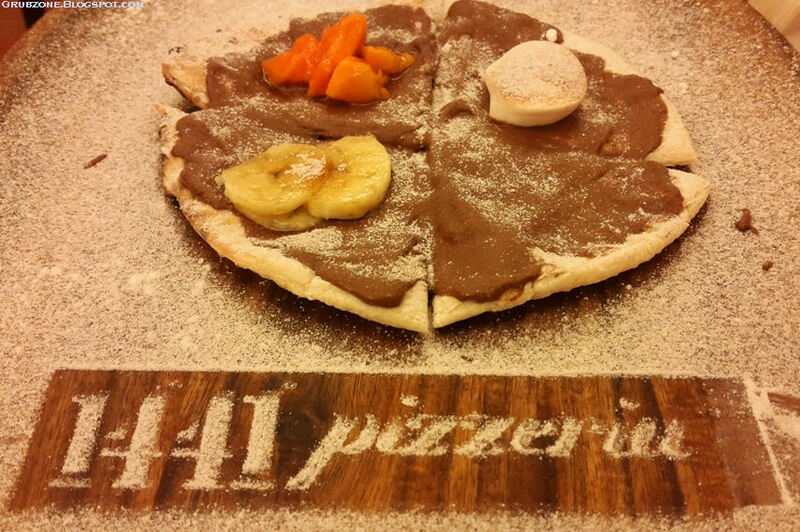 The Nutella Pizza has been a darling of instagrammers. There are so many images of it floating around from the first 1441 outlet that it definitely becomes an intriguing option for most people visiting the restaurant. But visible novelty aside, this pie was a major disappointment. Taking a pizza base, spreading some nutella over it and tossing some toppings on it is easy. There has to be something more than mere optics for this dessert to work. For me, I would have been content if this dessert was sweet. That was my only requirement. The salty pizza base was the party pooper. It is not difficult to create sweetened dough and use that to make dessert pizza bases rather than using regular bases. Had the base been sweet, this dessert would have worked as a sweet dish. But for now it requires work. I cannot comment on the service since I was part of a pre-opening meet. The servers were polite for the most part but they had their moments when they gave in to the chaos. One of the other invitees took my chair when I was standing up and looking the other way. The staff was completely helpless when I requested them to find me a replacement. Thankfully, I was spared as a few fellas were leaving and chairs became available after ten minutes of standing. The pricing seems to be a mixed bag. 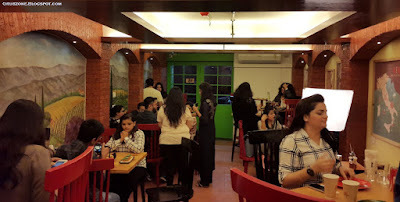 Its apt for their starters, salads and classical pizzas. But on the higher side for their customs and gourmet pizzas. 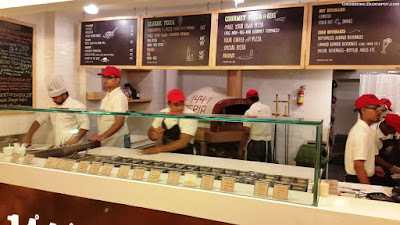 Though understandable since these pizzas use a lot more materials, the quality does need lot of improvement. This pricing is close to what places like Indigo or CPK charge and those places clearly have a superior pizza. 1441 has a nice concept but it clearly has a lot of work cut out for it. Captain : Time to set sail into what lies beyond this island. Engineer : You make it sound scary. Not very helpful. Tavern Owner : Venturing out to the treacherous sea, are ya? Just remember two bells save the day and three send you away. Captain : What is that supposed to mean? Tavern Owner : Who knows? Heard it from some fella who made it out of that sea alive.